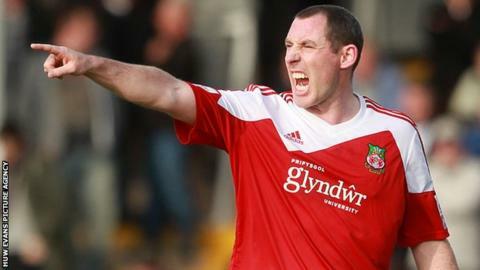 Wrexham manager Kevin Wilkin says defender Stephen Wright still has the chance to earn a new contract. The former Liverpool and Sunderland full-back has been released by the Conference Premier club. But the 34-year-old has asked to return to pre-season training in an attempt to change the manager's mind. "I'm not going to slam the door on Stephen and not allow the lad an option. That's Stephen's decision," Wilkin said. "Stephen will be 34/35 years old and doesn't get around the pitch quite as you need to as I feel at this level. "Stephen offered to us 'could I come back in pre-season and chance my arm' to which I had no issue at all. "He loves the football club, he loves being around the place and he's never been an issue to me. "As a player he always conducted himself in the right way and always tried very hard whether it be on the training field or the playing field. "I do like a trier in the game so if Stephen wants to take that chance and doesn't find anything that suits him in the meantime then he's more than welcome." Wright is among six players along with Dave Artell, Joe Anyinsah,Rob Ogleby, Kyle Parle and Jay Colbeck who have been released. Wright, a Uefa Cup winner with Liverpool in 2001, joined Wrexham in March 2012 following his release by Hartlepool United. He signed a two-year contract with the club in the summer of 2012 and played in Wrexham's 2013 FA Trophy final win over Grimsby Town.